I think it was the unicorn cake that did me in. Or maybe the one fashioned to look something like our cat Feargus. Really, it was most likely the sheer number of celebratory confections I made each year in a short window of time during those preschool and early elementary years. Cupcakes for classmates at school, more cupcakes for parties with friends, cakes for family celebrations. five of us – just the McPhauls living under this one roof – have birthdays within the span of 34 days. Add birthdays for a grandmother, an aunt, an uncle, and a cousin – all living locally – within a couple weeks of that timeframe, and it makes for a lot of birthdays. And a lot of cake. In those early kid birthday years, I carefully crafted pretty cakes. At least as pretty as I could make them. Everything was from scratch. The frosting was piped to perfection. Hours were spent on each creation. This morning-person mama sometimes stayed up far too late to make sure the cakes were ready for the next day – because who has time during the daylight hours to decorate cakes with toddlers running around needing attention all the time?!? There was the train cake, carefully assembled from an array of specially shaped mini cakes. 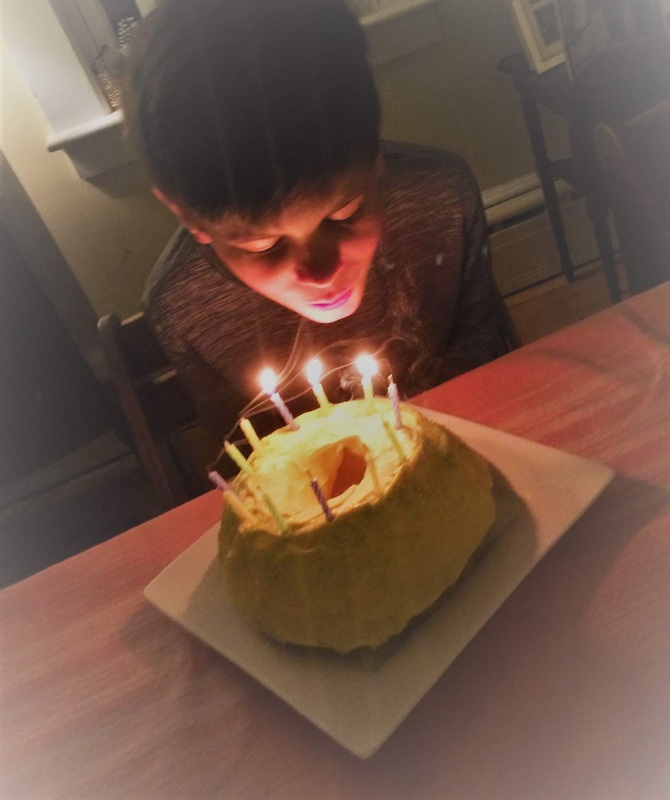 There was the simpler pond cake – round and blue-frosted with green lily pads and rubber ducky candles. There was a rabbit cake for my bunny-loving girl and a tractor cake for my John Deere-obsessed boy. There were snowman and soccer ball and pink puppy cakes. There were dinosaur cupcakes and butterfly cupcakes and panda bear cupcakes with Junior Mint noses and chocolate chip eyes. And then there was the unicorn. That cake involved a rocking horse-shaped cake pan, a meticulously frosted ice cream cone horn adhered to the cake with icing and covered in glittery sprinkles, and different-colored strands of frosting comprising the mane and tail. That unicorn was my pièce de résistance, my crowning glory in cake making. It certainly wouldn’t have won any prizes on Cake Wars, but my four-year-old loved it. Since that creation, I’ve knocked my cake-making endeavors down several notches. One year we even had a no-cake birthday season. We spent the day of two birthdays (my twins’) in Boston and had gelato for dessert at Quincy Market. We were in Disney World – a whole different sort of chaos – for the littlest’s birthday. Mostly, though, we just keep the cakes simple. The birthday kids get to choose the flavor (box mix) and the color of frosting (always homemade) and select a traditional-shaped cake pan. The number of candles lit corresponds to the birthday year. “Happy Birthday” is sung with gusto by people who love them. Their happy faces still glow in the light of those little candles as they make birthday wishes before blowing out the flames. Simple is still delicious. And with so many of us turning another year older this month, there is always plenty of cake to go around. Original content by Meghan McCarthy McPhaul, posted to her blog, Writings From a Full Life. This essay also appears as Meghan's Close to Home column in the January 25, 2019 issue of the Littleton Record.